When Lil' Miss was little and just starting to learn how to use sippy cups (around six months old), we had the hardest time finding one that would work for her. After much trial and error (and a cupboard full of sippy cups), we finally figured out that she preferred straws over spouts. We've since moved past that stage (thank goodness!) but Katy still prefers her drinks with a straw. 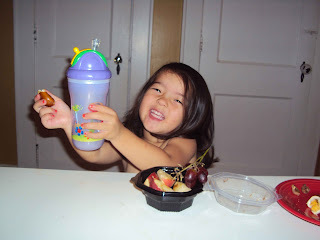 So, when we got the opportunity to review the Insulated No-Spill™ Flip-it™ cup, I was pretty excited and had high hopes! -I like that the straw can be "flipped" closed when not in use. This helps protect the mouthpiece from unwanted germs. -Fun cup designs and patterns- we have the ladybug. -Easy to hold and easy to carry around. Overall, I'd probably only give this cup a mediocre score since the spraying water got old pretty quick. However, Lil' Miss seems to gravitate toward the design and color, so that's favorable.